There will be quarterback drama for the Buffalo Bills in the first round of the NFL draft. How many quarterbacks are taken ahead of them in the top eight picks? The two teams above the Bills most likely to take a QB are Arizona at No. 1 and the New York Giants at No. 6. Some speculate that Oakland could throw a curveball and draft a QB at No. 4. The teams behind the Bills that might want a QB are: No. 10 Denver, No. 11 Cincinnati, No. 13 Miami and No. 15 Washington. The latter two, the Dolphins and Redskins, have a more dire need than the Broncos and Bengals. The Giants have the 17th pick and could wait until then to find a successor to Eli Manning. The best: Kyler Murray, Oklahoma. The Heisman Trophy winner isn’t everyone’s definition of the ideal quarterback, given his 5-foot-10-inch stature. But the rookie success last season of Cleveland’s Baker Mayfield, who stands 6 feet and 5/8 inches, further proved that shorter QBs with elite skills can win. Murray has an NFL arm and elite athleticism. Just ask baseball’s Oakland A’s, who made him a No. 1 pick in 2018. Bills view: The Bills are out of the QB market. They locked up both Matt Barkley and Derek Anderson by the end of last season to serve as veteran backups to Josh Allen. The Bills love their QB room the way it is. The No. 2 QB? It would make sense for the Giants to take Ohio State’s Dwayne Haskins at No. 6. But maybe not. Missouri’s Drew Lock and Duke’s Daniel Jones both are good bets to go in the first round. Bulls watch: The University at Buffalo’s Tyree Jackson is projected to go anywhere from the third to fifth rounds. An ideal spot? How about the Los Angeles Chargers as the backup to Philip Rivers, who will turn 38 in December, and Tyrod Taylor. That could give Jackson a year or two to improve his mechanics. Tank for Tua: If Miami does not take a QB at No. 13 you can presume they have their eyes on the 2020 draft, in which Alabama’s Tua Tagovailoa could be the No. 1 pick. Ryan Fitzpatrick currently is the top QB on the Dolphins’ roster. Sleeper: Jake Dolegala, Central Connecticut. The Hamburg native is an intriguing sleeper because of his size (6 feet, 6 3/4 inches and 240 pounds) and rocket arm. Dolegala has a quick, effortless release and throws with every bit as much power as UB’s Jackson. He starred at St. Francis, but a serious shoulder injury his senior year derailed his college plans. After a year of prep school, he landed at Central Connecticut, where he threw for 8,129 yards and 48 touchdowns. If he’s not a late-round pick, he’s expected to be an undrafted rookie signing. 1. 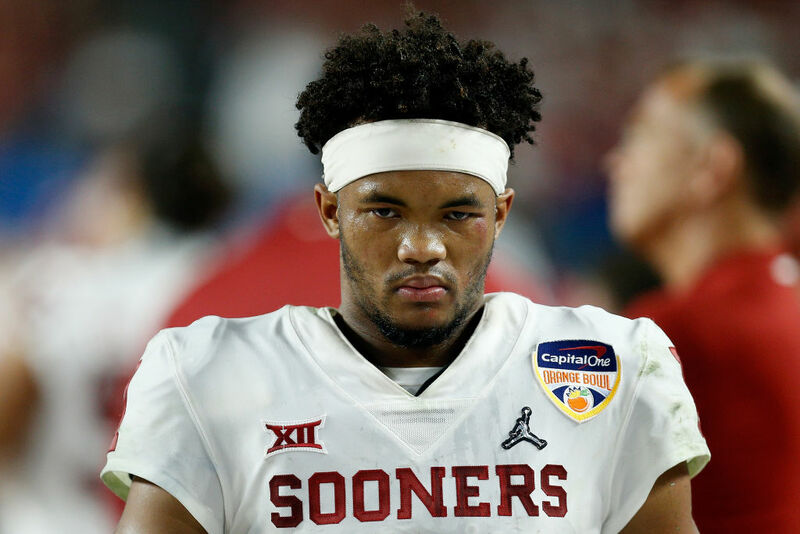 Kyler Murray*, Oklahoma, 5 feet, 10 inches, 207 pounds. Heisman Trophy winner averaged 331 yards passing, 71 rushing and 3.8 TDs a game. 2. Dwayne Haskins*, Ohio State, 6 feet, 3 inches, 231 pounds. One-year starter is a pocket passer with classic size. Opinions on him vary. 3. Drew Lock, Missouri, 6 feet, 4 inches, 228 pounds. Tall, four-year starter with big arm talent could be target of Broncos. 4. Daniel Jones*, Duke, 6 feet, 4 inches, 220 pounds. Former walk-on started 35 games. Shows poise and smarts. Could go in top 17 picks. 5. Ryan Finley, N.C. State, 6 feet, 4 inches, 212 pounds. Pocket passer with good anticipation, not elite physical tools. A distributor. 6. Tyree Jackson*, Buffalo, 6 feet, 7 inches, 249 pounds. Offers elite size and cannon arm. Big upside if he can develop consistency. 7. Jarrett Stidham*, Auburn, 6 feet, 2 inches, 214 pounds. Good tools, with NFL arm, quick release. Ran simple college offense. Needs time. 8. Clayton Thorson, Northwestern, 6 feet, 4 inches, 226 pounds. Quality arm talent with good athleticism. Smart. Threw 45 interceptions. 9. Will Grier, West Virginia, 6 feet, 2 1/2 inches, 218 pounds. Productive QB with good leadership, marginal size, average arm. 10. Gardner Minshew II, Washington State, 6 feet, 1 inch, 224 pounds. Put up huge numbers in pass-happy offense but has only average tools.